Stitching across America! | NJNA is Blogging! Heidi and I are both enjoying the class American Mosaic, a four day class in which each state is a different thread and a different stitch. We should be set for stitch directions for quite a few projects to come! 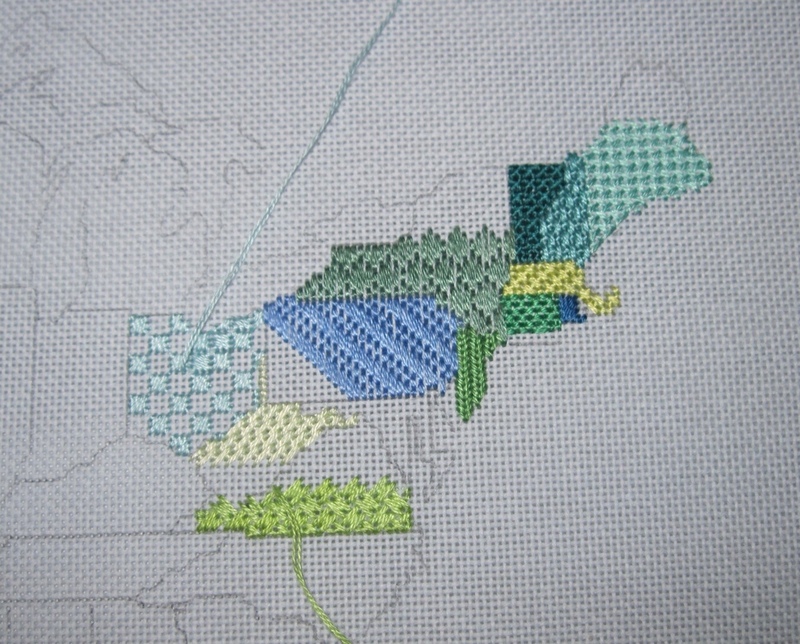 As we started in New England, we were able to finish a few states before moving on to the next one, but you can see in the picture below that I have a few unfinished states and a few loose threads. As the light (and energy level) is better in the morning, I am going to do my homework of Delaware early tomorrow morning. I have to say that some of these borders are really fussy! Fortunately, the compensating of the stitches that Gail Sirna has selected are relatively easy, (says she who has not yet attacked Maryland which has lots of wonky borders!). As we have over fifty threads in our envelope of threads, the first thing that Gail had us do was to pull out all the threads in the greens and blues and lay that out by manufacturer and number sequence. That has really helped in locating the thread needed as we threaded up our needles for the next state. I was even able to put a few threads in the bag of “all done” threads! We have also learned a bit about our history and geography in the explanation of the borders and how they got that way. I am finding the class fun, entertaining and educational. More about class tomorrow.